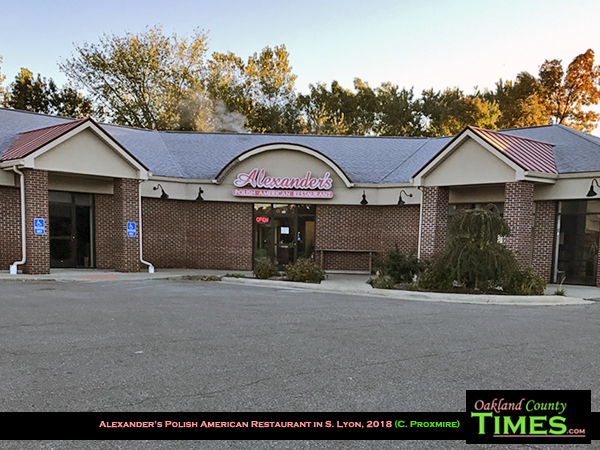 South Lyon, MI – Alexander’s Polish American Restaurant looks like any typical American diner, with tables and a row of booths in a room with nondescript décor. Yet in this simple atmosphere visitors will find an abundance of neighborhood friendliness and a selection of foods to satisfy both new world and old world palates. I was there the other day for breakfast. They may remember me because I spilled my ice water all over my booth while reaching for my pen, which led to good conversation with the waitress about the frequency of mishaps in the restaurant business. She was nice about it. She also knew all the other customers by name, and many she could guess their order before they even said it. Food-wise I skipped past the many omelet choices and went for a traditional Polish meal of potato pancakes and grilled kielbasa. 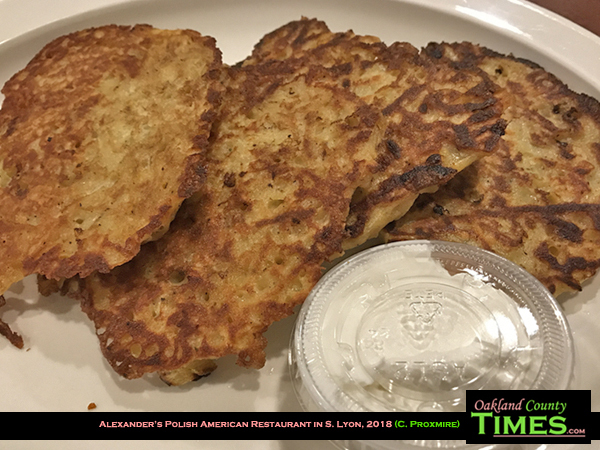 The potato pancakes come with a choice of sour cream or applesauce. There are four giant potato pancakes on the platter, so I ended up taking half in a box to go. The kielbasa was plentiful also. I ended up basically with two meals. I also had hot chocolate, which I thankfully did not spill. 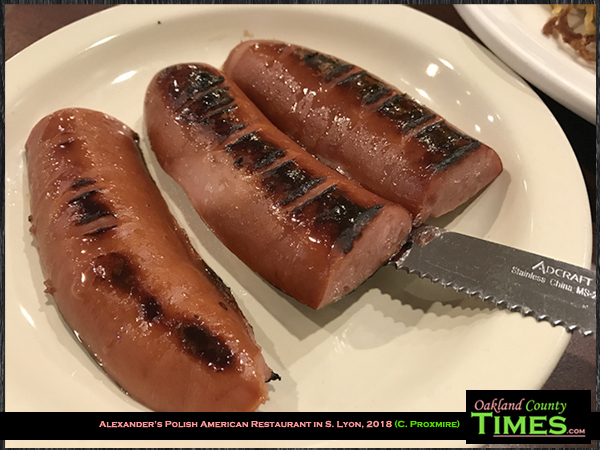 Alexander’s serves breakfast, lunch and dinner. Along with burgers and French fries, the restaurant has more Polish favorites like dill pickle soup, pierogis, and stuffed cabbage. The prices were all surprisingly low. They are located at 559 S Lafayette St, South Lyon, MI 48178. They do not have a website, but they do have a Facebook page.